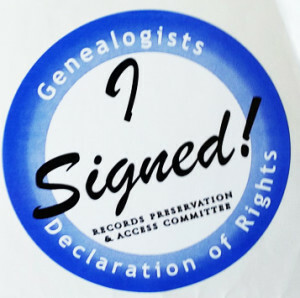 Have you signed the Genealogists’ Declaration of Rights yet? If you went to the IAJGS conference last summer, you may have signed the books at the IAJGS table in the central hallway. So far, the Declaration has collected 8,000 signatures, but it needs 10,000 to be heard. Federal and state legislation and regulations are coming this year where it will be critical to have the 10,000 signatures. if you haven’t signed, it’s important for you to do so. The Declaration comes from RPAC, the Records Preservation and Access Committee. Several organizations (FGS, NGS, ASG, APG, BCG, ICAP-Gen, IAJGS, proQuest, and Ancestry) have banned together to give us a voice in the US and state governments. Many government entities are threatening to take away any access we may already have to records that are needed to discover our family histories, often under the fear of identity theft. Identity theft almost never occurs through genealogical means — but our government needs for us to tell them and we need enough voices behind our representative speakers for them to listen. Imagine if we had even less access to the records than we do now. How far would you get in your research? If you didn’t already sign, or don’t remember, please sign the online version at http://bit.ly/gen-declaration. It’s the easiest way to participate in the Declaration. And invite all your friends and family as well. If they support your pursuit of genealogy, then they should be happy to sign. The Knowles Collection, a quickly growing, free online Jewish genealogy database linking generations of Jewish families from all over the world, recently reached its one millionth record milestone. The database was begun seven years about by UJGS’s Todd Knowles, the Jewish genealogy specialist at the Family History Library. “My search for my great-great-grandfather Morris David Rosenbaum, a Polish Jew, eventually led me to begin compiling the genealogical records of the Jewish people,” recounted Knowles. Todd began by following Rosenbaum from Poland through England to the United States. He discovered the Mordy Collection in England, which had been compiled by Isobel Mordy, containing information about 150 individual pedigrees with over 7500 records. Mordy didn’t have the Internet and other current resources, so Todd used FamilySearch.org and records at the Family History Library to digitize, organize, and research, to publish more than 10,000 Jewish names from the British Isles. The collection has since grown to six databases for Jews of the British Isles; North America; Europe; South America and the Caribbean; Africa, the Orient, and the Middle East; and the South Pacific. The Knowles Collection was recently moved on the FamilySearch web site so it’s easier to find, under the Search > Genealogies section at https://familysearch.org/family-trees. Todd continues to add to the database via research and indexing as well as receiving donations of data. He regularly writes about new collections that are added to the Knowles Collection on his blog. This information was provided to us via FamilySearch. The entire press release is online. 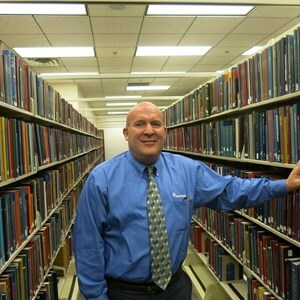 If our members want to know more, Todd attends most of our meetings and he would be happy to answer any questions you may have about the Knowles Collection. 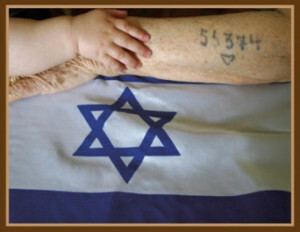 Tomorrow is Yom HaShoah, Holocaust Memorial Day or Holocaust Remembrance Day. To mark the occasion, the Salt Lake City JCC is holding an event on Thursday, April 16th, from 1-3pm. The keynote speaker will be Dr Noemi Mattis, whose parents were leaders of the Belgian Jewish resistance movement. She will share her story of being a hidden child to protect her from the Nazis in World War II. The event is free and open to the public, sponsored by the JCC and the United Jewish Federation of Utah. Avotaynu Inc. is pleased to announce the creation of Avotaynu Online, an exciting new venture intended to stimulate collaboration among Jewish genealogists in all its forms. Leading participants in the various areas of genealogical research will provide in-depth articles on events and discoveries on a regular basis. As a bonus, all articles from 2007-2011 published in Avotaynu are available at no charge at the Avotaynu Online web site. Readers can subscribe by email at the Avotaynu Online site or by RSS reader, or follow the public commentary on the official Facebook page, as well as Twitter, YouTube, LinkedIn, Pinterest, and other social media outlets. By virtue of its focus on the in-depth reporting of specific subjects, Avotaynu Online is intended to be entirely distinct from the existing print journal, Avotaynu. Avotaynu Online aims to promote conversation within the genealogical community on the subject it covers. Unlike print, which is a one-way medium, readers of articles will be encouraged to respond to the authors directly from the web site and to engage them in developing new lines of thinking. In the past, Avotaynu was limited by available space in the quarterly journal, but with virtually unlimited space online, the web site will free them from that limitation. The managing editor of Avotaynu Online will be Adam Brown, who has been a curator for the collaborative online family tree hosted by Geni/MyHeritage and is the founder of the Jewish DNA Project at FamilyTreeDNA. Sallyann Amdur Sack-Pikus will be Editor-in-Chief and Gary Mokotoff will be Publisher. IAJGS Vice President Ken Bravo was recently interviewed by Bernice Bennett on blogtalkradio. After seeing an obituary in the New York Times claiming that someone’s name was changed at Ellis Island, Ken researched the family and proved the myth to be false. With little response from the Times, he found more obituaries perpetuating the same myth, researching each of them to prove them wrong. Listen to the podcast below or visit the original page. It’s time again for RootsTech, the genealogy conference brought to us by FamilySearch, at the Salt Palace Convention Center. RootsTech takes place this week, February 12-14. This year, it runs in conjunction with the Federation of Genealogical Societies (FGS) conference, so expect more people and more sessions. There will be some sessions streamed live over the Internet. A few have been mentioned in various articles and blog posts, but no official and complete list has been posted yet. Watch the RootsTech home page for that. In previous years, all of the morning keynote sessions were live streamed, and other sessions that occurred in the same large room. As in previous years, the Expo Hall will be a focal point of the conference, open each day at 10am until, 6, 7, and 4pm. While not specifically stated again this year, it is likely to be open to the public. IAJGS will again have a booth so come on by and visit, while also seeing what else is going on in genealogy and technology. Are any UJGS members planning to go to RootsTech? In honor of Veteran’s Day, FindMyPast is offering free access to their collections this weekend, November 7th through November 10th. Their collections include US, UK, and Irish records, US and UK historical newspapers, military records, passenger lists, and more. You will need to be signed in to access the records, but you can register for free if you don’t already have an account. Visit their web site to learn more about the records they have to prepare your search queries for this weekend. If you’re not busy this Saturday, you might want to spend the day at the Family History Library. On October 11th, from 9am to 4:45pm in the B2 classroom, some of the best known speakers in genealogy will be presenting a day of genealogy education, free and open to the public, sponsored by the Board for Certification of Genealogists (BCG). Everyone is welcome to attend any lecture or to stay for all six. Remember that Saturday parking is free in the lot behind the museum. The Foundation of Eastern European Family History Societies (FEEFHS) has an annual workshop in Salt Lake City. This year, their three day workshop will be August 11-15. As a special treat, the presentation on Wednesday, August 13, will be open to the public and free to attend. Diane Afoumado, PhD., Chief, International Tracing Service (ITS) Research Branch, US Holocaust Memorial Museum, will be speaking on the records and the services offered by the ITS. The ITS collection will be of interest to anyone with ancestors who may have been persecuted or displaced during WWII. 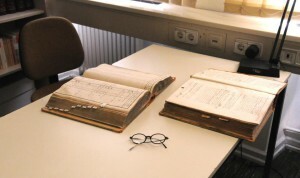 Documents such as camp arrival lists, grave locations, transport lists, prisoner cards, forced labor lists, death lists, displaced person applications for assistance, deportation lists, emigration application or questionnaires, registration and work cards, sometimes with photographs, are contained in the collection. Research services to access those records are provided by ITS to the public at no charge. Anyone may attend the Wednesday evening presentation and subsequently set up an appointment to meet with Ms. Afoumado on Thursday following the presentation to begin the research process. Thanks to Peg Ivanyo, FEEFHS conference chair, for informing us about this event. If you’re not busy the weekend of June 6th, you might spend your days at your computer. The Southern California Genealogical Society (SCGS) Jamboree, as it has for several years, will be streaming many sessions from the conference. They begin on June 5th with the DNA Conference, where the sessions are not free. The following three days include a variety of sessions, including a couple on DNA and genetic genealogy, fourteen in all. As with all SCGS webinars, they will be free to view live and many will be available to members only after the event. F. Warren Bittner, CG – Elusive Immigrant! Many other sessions will be available in two weeks. Visit the Jamboree Blog to see the entire schedule of streamed sessions. Or visit the SCGS Streaming Schedule and click on each session for a more detailed description and to register for the webinar.